- with a larger and spacious inner room and space. 1. What can we get from this vehicle assembly project? 4) Earn your own Intangible Assets: with the vehicle assembly project, you can have, create and develop your own auto brand, logo and also exapand to the neighboring countries by using the preferencial tariff policy among your communities. 5) Creating more and more job opportunities for your local people of your country and driving and leading your country's industry to develop and stimulate the economic growth of your country, thus you can get more good and preferential policies from your government, this is a positive circle for the development of your assembly project, you win, the government win, the people win, all win !!! Join us to put it into reality!! 4) Hardware Requirements on the Import Tariff: this is the most important factor, the difference gap between auto spare part CKD (completely knocked down) and CBU (complete built unit) shall be at least 30-35%, for example, import tariff on CBU is 35%, it must be 5% or zero on CKD. 5) Good relationship with the local government, can get good / preferential policies from the government, or may odtain government orders for the assembly project and the plant. 3. What about the after-sales service? 6) The most important - Technology Support. To summarize, the above three (3) points are the reasons that why this vehicle assembly project can be successful in most of the countries, why we can succeed!! 1. Our company is focusing on the vehicle assembly project throughout the world, so far, we have successfully set up several auto assembly plants in Syria, Ghana, Seychelles, Vanuatu, Angola, Nigeria for pickup, SUV, mini moke and mini bus assembling. 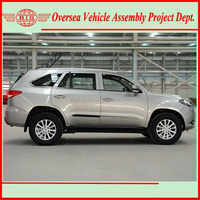 6) Providing complete set of assembly equipments of the above mentioned automobiles. If you are interested, contact us now, we will never make you disappointed ! Seize this opportnity, you win, we win, win-win !! Looking forward to your cooperation! !